There have been a number of network links written for Google Earth for showing geo-tagged photos (tied to the place where they were taken). Over a year ago, the author of Geoblogger.com, Rev Dan Catt, did some neat Google Earth network links letting you see geo-tagged Flickr photos. The Flickr folks liked it so much, he ended up with a job there. A few months later, Flickr created Flickr Maps for viewing geo-tagged photos. 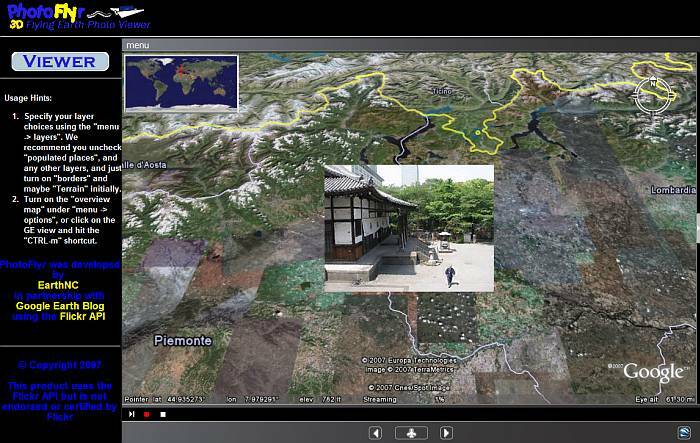 Google Earth has it's own built in photos now thanks to the Panoramio layer. 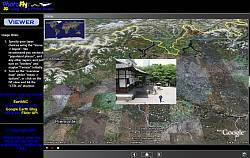 Recently, we saw the release of TwitterVision (for viewing the most recent Tweets on a Google Map), and more recently FlickrVision (for viewing the most recent Flickr photos on a Google Map). Both of these were written by David Troy. This more dynamic way of viewing recently posted content is mesmerizing and fun to watch in Google Maps. I wrote a blog entry about some ways you could view photos in Google Earth in a similar fashion. Now I want to share another method for viewing the most recent photos with position information from Flickr by using Google Earth. Check out PhotoFlyr.com which was co-developed by EarthNC's Virgil Zetterlind, with a little help from Google Earth Blog (in other words: me). You can view it either in a browser window (using Google Earth thanks to a plug-in by Google Earth Airlines), or with a network link directly (for those of you running on a Mac, Linux, or who just want the full application). See below for more details. If a photo was posted with geo-tagged (coordinates) information, you are seeing that location. If it doesn't have coordinates we use the photo's user id location. Otherwise we skip that photo. There were some other tricks Virgil developed to keep the network link running smoothly and to minimize demand on the Flickr API for larger numbers of users (hopefully they appreciate that). If you're using the plug-in, you can click on the little GE logo in the lower right of PhotoFlyr and it will open up the Google Earth window. Then hit F11 and you can view the Flying Viewer full screen! We have other innovations in mind for the application. But, we thought we would release this since Google Earth is a fun way to view dynamic real-time content in 3D. Let us know what you think! These are all awesome mash-ups, aren't they though? As I wrote on my blog about getting lost in Flickrvision - it's just so interesting to see how common we all are as human beings, in the global context. And based on nothing more than the common threads that humanity demonstrates through the simplicity of pictures - imagery! In many ways - the view is extraordinary in this context, adding realization that just as the Earth is beautiful from up above - so too are its people.